Happy Trash provides Roll Off Services in Lubbock Texas. Happy Trash services both residential and commercial customers. We have many long term repeat customers as well as first time users. Many of our customers use roll offs for cleaning out houses, rent houses, and construction projects. Roll-offs are generally used to haul large loads of construction waste or other waste types. Roll Off containers are used for jobs with large materials or large quantities of materials. 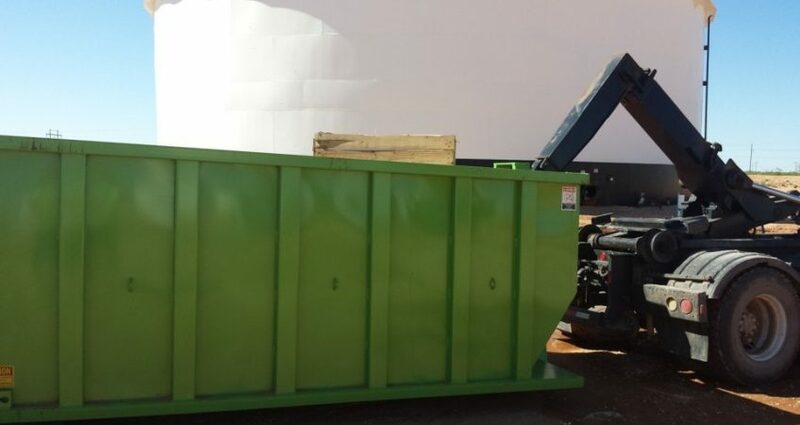 A roll off dumpsters is a large container that is placed in a driveway, parking lot, or street and where waste may be placed until the dumpster is removed for dumping. Roll Off dumpster can also be used for recycling cardboard and scrap metal. Roll Off Service is the most efficient way to dispose of bulk trash or loads with a heavy amount of waste. Roll-off dumpsters are larger dumpsters. Typical sizes are 15 cubic yard, 20 cubic yard, 30 cubic yard, and 40 cubic yard. Happy trash currently only carries 30 yard roll off dumpsters for demolition sites, home clean-outs, renovations, construction sites, factories, and large businesses. We offer one time use, multi-use, or continued use roll off services. Roll off dumpsters are known by several names such as Roll-off/containers/dumpsters/roll-back/open-top. These containers are generally transported and emptied by roll off trucks with hydraulic systems to lift, deliver, and empty the containers. Happy Trash uses Hook Lift dumpsters allowing us to place containers in tight areas. Most roll off companies use what is called “cable lift” systems. These systems use a steel cable to pull the roll off container up on the truck and use gravity to place the container back on the ground. This sometimes results in drag marks, gouges, and damage to the surface the container is placed on. Our customers appreciate our hook lift containers and trucks. Our trucks can place containers under hydraulic power and keep the front of the container off the ground, making drag marks and damage very unlikely. We also have the ability to set containers on raised surfaces such as loading docks for easy usage, something cable trucks cannot do. Dumpster can be placed in driveway, street, parking lot or yard. Call Happy Trash At: 806-319-6438!